We are an eminent name, which is engaged in delivering Rubber Water Hose to our clients. The offered range of rubber water hoses is designed & developed by reliable vendors, who ensure to bring it in strict tandem with the 444/87 type 1, 2 and 3a norms and standards. Along with this, the offered range of rubber water hoses is applicable for delivery tasks in mines, dams, railways, construction sites, irrigation, horticulture and panic areas. This range is also applicable for fire fighting and DE watering during floods. 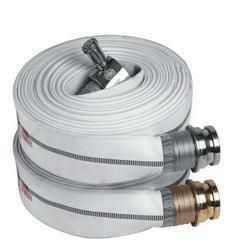 Our customers can avail RRL Hoses from us. The offered range of RRL hoses is designed utilizing optimum grade raw material at dependable vendors' premises. Along with this, the offered range of RRL hoses is tested on different parameters to maintain its authenticity throughout the manufacturing process. Made using fabric reinforced rubber lined RRL technology, the offered range is available with additional textile reinforcement in the hoses that are same as double jacketed. Backed by the rich experience and a competent team of professionals, we are able to offer High Pressure Rubber Hoses. The offered range of high pressure rubber hoses is suitably inspected in varied characteristics to ensure its adherence with the highest quality norms and standards. Along with this, the offered range of high pressure rubber hoses is best suited to operate with acids, chemicals, oil and other products like air, gas and fume extraction. This range is implemented on water blasting and all types of cold, hot and steam pressure cleaners. We are an eminent name, which is engaged in delivering Rubber Hose For Sand Blasting to our clients. The offered range of rubber hose for sand blasting is designed & developed by reliable vendors, who ensure to bring it in conformation with IS 5894/90 and IS6417/90 standards. Along with this, the offered range of rubber hose for sand blasting is used in different areas such as sand/shot blasting purpose in ordnance factories, steel furniture manufacturing workshops, heavy engineering industries and other industries. 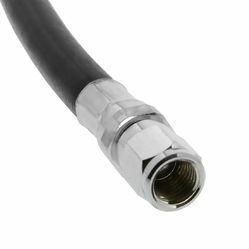 Owing to the immense experience and a competent team of experts, we are able to offer Rubber Welding Hose to respectable clients. 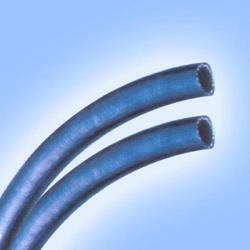 These rubber welding hoses offered by us are made utilizing high grade raw material at trustworthy vendors premises. In addition to this, the offered range of rubber welding hoses is ideal for wielding woven textile and braided synthetic fibers. This range is applicable in steel mill, ship building and power stations. 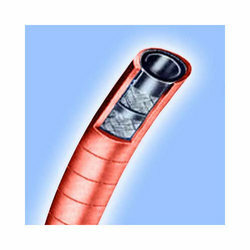 In order to cater to the diverse requirements of honorable clients, we are able to offer Rubber Hose. The offered range of rubber hoses is made by reliable vendors, who ensure to utilize high grade raw material and highly advanced technology in strict compliance with the international quality standards. Along with this, the offered range of rubber hoses is applicable for workshops, steel mills, ship building and power stations and repair yards. Possessing seamless tube with a combination of natural and synthetic rubber, the offered range is best suited for resistance to oxygen, fuel gas and non-combustible gases. Available with plain or fluted rubber cover, the offered range is interwoven with synthetic fiber or plies of woven textile. 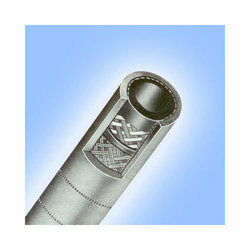 We are an eminent name, which is engaged in delivering Rubber Hose at clients' premises. 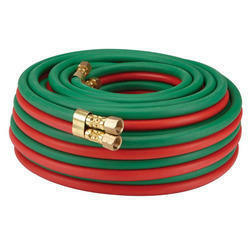 The offered range of rubber hoses is manufactured utilizing natural, synthetic or blended rubber by dependable vendors, who ensure to match it with the international quality norms. Along with this, reinforcement of these products are made using natural, synthetic rubberized woven textile fabric. Cover of these products are developed using synthetic rubber compound.